Heat oven to 350°F (325°F for dark or nonstick pans). Place paper baking cup in each of 24 regular-size muffin cups. Make and bake cake mix as directed on box for 24 cupcakes. Cool in pans 10 minutes; remove from pans to cooking rack. Cool completely, about 30 minutes. For cats, stir together 1/2 cup of the frosting and the chocolate syrup. Spread chocolate frosting over tops of 8 cupcakes. Cut small pieces of fruit snack for ears. Cut additional fruit snack into 1x1/4-inch strips for whiskers. Use chocolate chips for nose and eyes. Arrange on frosting to make cat faces. For rabbits, spread half of the remaining vanilla frosting over tops of 8 cupcakes. Flatten large gumdrops with rolling pin; slightly fold and shape to form ears. Use pink gel to make inner ears. Cut fruit snack or flatten gumdrops and cut into 2x1/4-inch strips for whiskers. Use baking bits for eyes and nose. Arrange on frosting to make rabbit faces. For dogs, spread remaining vanilla frosting over tops of remaining 8 cupcakes. 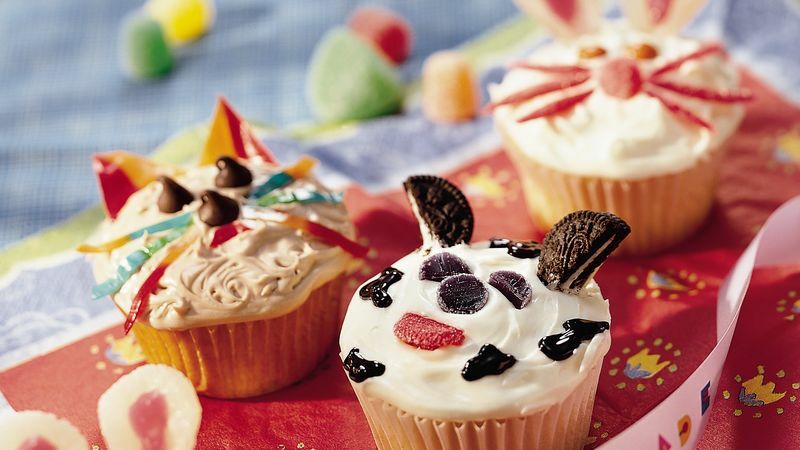 Break or cut cookies in half; press 2 halves in each frosted cupcake for ears. Use black gel for spots or streaks on face. Use small gumdrops for eyes and nose. Flatten additional gumdrops for tongue. Arrange on frosting to make dog faces. Store loosely covered. Get a party menu, prep guide, tips, party games, activities and more for a Pet Lovers' Birthday Party!